North American’s Autumn Hills Compression Station is located on 5 acres of land in Zeeland Township, Ottawa County, Michigan, adjacent to Waste Management of Michigan’s Autumn Hills Landfill. Zeeland Township is near Holland, Michigan. The Compression Station is designed to compress & process 4,000 Standard Cubic Feet of Gas per minute (“SCFM”). In 2004, North American Natural Resources, Inc., Zeeland Farm Services, Inc. (“ZFS”), and Waste Management, celebrated the ground breaking of a landfill gas pipeline/compression station project that carries methane gas from the Autumn Hills Landfill to the ZFS soybean processing plant over six miles to the Northwest. Waste Management sells the Landfill gas, which is generated naturally when organic waste in its Autumn Hills landfill decomposes to North American. 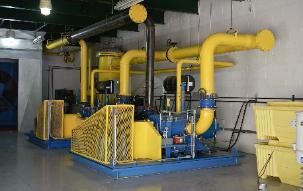 The project allows the landfill gas to be used in ZFS's converted boilers to meet all processing heat/steam demand.